Dr. Willie Parker is an abortion provider because of, not despite, his Christian faith. At a moment when refusal of care due to conscience claims obstructs reproductive justice, emphasizing the role conscience plays in compassionate and ethical medical care, as Dr. Parker does, means a revolutionary shift in thinking about power—prioritizing the needs of the woman seeking care. The use of conscience claims to deny health care services is a focal point in current debates on abortion access and was a central issue at the recent Abortion and Reproductive Justice Conference (ARJC) in South Africa. In an auspicious start to the ARJC, the host-city, formerly known as Grahamstown, had recently voted to discard the name of Graham, a brutal colonizer, to rename in honor of Makhanda, a Xhosa freedom fighter and philosopher. To: Señora Magistrada CRISTINA PARDO SCHLESINGER, Corte Constitucional, E.S.D. The International Women’s Health Coalition (IWHC) submitted an amicus brief to the Constitutional Court of Colombia, urging the court to defend women’s rights and health by upholding the right to safe and legal abortion. In October 2018, the court voted 6 to 3 to maintain no time frame restriction on legal abortion, denying a request to limit abortion to the first 24 weeks of pregnancy. Excerpt: Research into the experiences of women confronted with the denial of abortion indicates that they face an increased risk of physical and psychological harm, socioeconomic disadvantage, and even shortened lifespans. In August 2017, IWHC, in conjunction with Mujer y Salud en Uruguay, organized the Convening on Conscientious Objection: Strategies to Counter the Effects, in which 45 participants from 22 countries discussed the consequences of denial of sexual and reproductive health care and shared data from their home countries. Convening participants who work at the community level recounted experiences of women who have suffered the negative effects of conscience claims. control and sterilization, and care and treatment of female survivors of sexual assault, to name just a few in this short response. There appears to be exceedingly little literature exploring this issue, and even less case law, but the 2016 case of Tamesha Means v. United States Conference of Catholic Bishops provides some insight and direction into what such a case might look like. viders who conscientiously refuse to perform one in such circumstances are guilty of murder or reckless homicide, if the woman dies as a result of their refusal. A criminal homicide conviction requires an established standard of care that goes unmet, combined with a causal link between the failure to meet that standard and the death that eventuates (Nelson 2018). Physicians and hospitals uncontroversially have a legal duty to care for their patients. If their refusal to render that care causes someone’s death, they seem to clearly meet the criteria for criminal homicide. Nelson shows that this fact cannot be mitigated by claims about earnest moral intentions, or the right to free exercise of religion (Nelson 2018). He contends that expert medical witnesses would establish in court that physicians faced with emergency circumstances have a duty to provide medically necessary care, regardless of their conscientious beliefs. Finally, he argues that statutes exempting physicians from providing abortions in emergencies (which exist in a staggering 45 U.S. states) are unconstitutional. In his excellent piece, “Provider Conscientious Refusal of Abortion, Obstetrical Emergencies, and Criminal Homicide Law,” Lawrence Nelson makes a compelling legal argument against physicians’ refusal to provide life-saving abortions (Nelson 2018). We want to make the equivalent moral argument. Nelson says that physicians who refuse to perform abortions are violating the “legal duty to treat the woman,” but he suggests that they may be “honoring a moral duty not to kill a fetus.” We take issue with that suggestion. Instead, we maintain that just as a physician who refuses to provide abortion violates a legal duty, that physician violates a moral duty as well. The International Women’s Health Coalition (IWHC) and Mujer y Salud en Uruguay (MYSU) co-organized a global Convening on Conscientious Objection: Strategies to Counter the Effects, in August 2017. The meeting was designed to analyze and address the phenomenon of health care providers refusing to provide abortion care by using personal belief as a justification. The organizers were called to action by the global expansion of this barrier to abortion access and the experiences of women who were denied their right to an essential service. Forty-five participants from 22 countries convened in Montevideo, Uruguay, including activists and advocates, health care and legal professionals, researchers, academics, and policy-makers. The convening catalyzed an agreement that proponents of women’s rights should challenge the use of conscience claims to deny access to abortion care. The participants also identified strategies to counter the adverse effects that the refusal to provide care can have on the health and rights of those needing services. Throughout three days of presentations and working groups (appendix B), participants shared their experiences and expertise on policies and legal frameworks, ethics, health care training and provision, activism, research, and communications. 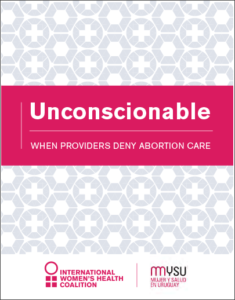 The result: recommendations that advocates can use to tackle the growing trend of health providers using claims of “conscientious objection” to deny abortion services. In this report, we present the key points and strategies discussed at the convening, with practical recommendations at the end of each section, and a summary of takeaways in the conclusion. Click here to view Policy Brief based on the report. Joining the health care profession is voluntary, unlike conscripted military service. The military objector pays a price, often undergoing a government vetting process, carrying out obligatory alternative service, and frequently facing stigma and discrimination. In the case of the refusal of health care based on conscience claims, the providers do not pay a price, while others do. The most severely affected, of course, is the person denied care. Providers who refuse to deliver a service also increase the workloads of their peers who choose to uphold their professional obligations to provide comprehensive care. Finally, accommodating providers who refuse to perform essential aspects of their jobs can cause costly disruptions and inefficiencies in the health care system and divert precious resources away from service provision. 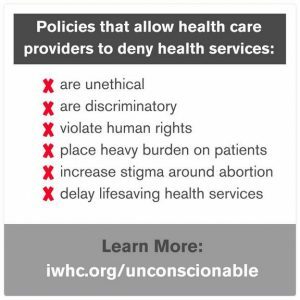 Currently, more than 70 jurisdictions have provisions that allow so-called “conscientious objection” in health care, according to an analysis of preliminary data from the World Health Organization’s Global Abortion Policies Database. Many national laws stipulate that health care providers are required to carry out an abortion in case of an emergency, or if no one else is available. Evidence clearly shows, however, that even where regulations are in place, they are extremely difficult—and costly—to enforce. Despite the difficulty of regulating conscience claims, participants agreed that governments should enforce regulations and ensure that all women are able to access affordable, comprehensive health care. 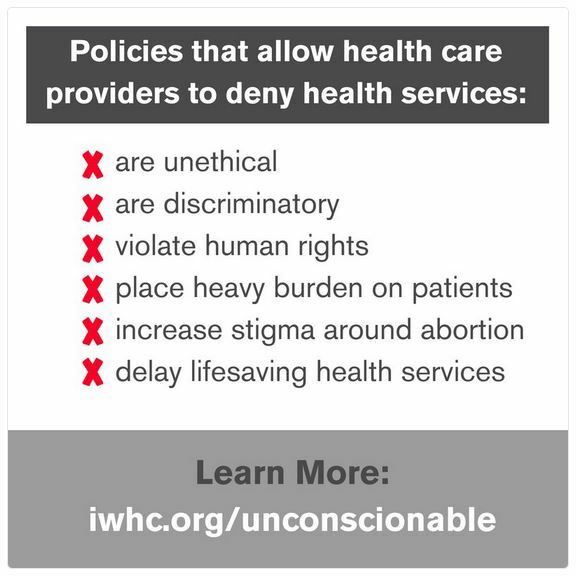 Most convening participants agreed that health care policies should not allow for the refusal to provide services based on conscience claims. Where policy-makers are revising abortion laws or policies, they should not make references to conscience claims. Enshrining into law the notion that providers’ personal beliefs can determine the provision of health care opens up the door to abuses and legitimizes conscience claims. Finally, the convening participants resoundingly agreed that health care providers and women’s rights advocates must not cede the term “conscience” to those who misapply it to deny others health care, which should more appropriately be called “refusal to provide services” or “denial of services based on conscience claims.” They agreed to bring the agreements from the convening, and the recommendations captured at the end of this report, to their own work, so that no one is denied their right to health care. Br Med Bull. 2018 Jun 1;126(1):47-56. In recent years questions have arisen about the moral justification for the accommodation of health care professionals who refuse, on conscience grounds as opposed to professional grounds, to provide particular professional services to eligible patients who request that kind of service. Central to concerns about the accommodation claims of conscientious objectors is that health care professionals volunteer to join their professions that typically they are the monopoly providers of such services and that a health care professional’s refusal to provide professional services on grounds that are not professional judgements amounts to unprofessional conduct. Defenders of conscientious objection maintain that in a liberal society respect for a professional’s conscience is of sufficient importance that conscientious objectors ought to be accommodated. To deny conscientious objectors accommodation would reduce diversity in the health care professions, it would deny objectors unfairly equality of opportunity, and it would constitute a serious threat to the moral integrity of conscientious objectors. In this paper, I argue that the conscience clause around abortion provision in England, Scotland and Wales is inadequate for two reasons. First, the patient and doctor are differently situated with respect to social power. Doctors occupy a position of significant moral and epistemic authority with respect to their patients, who are vulnerable and relatively disempowered. 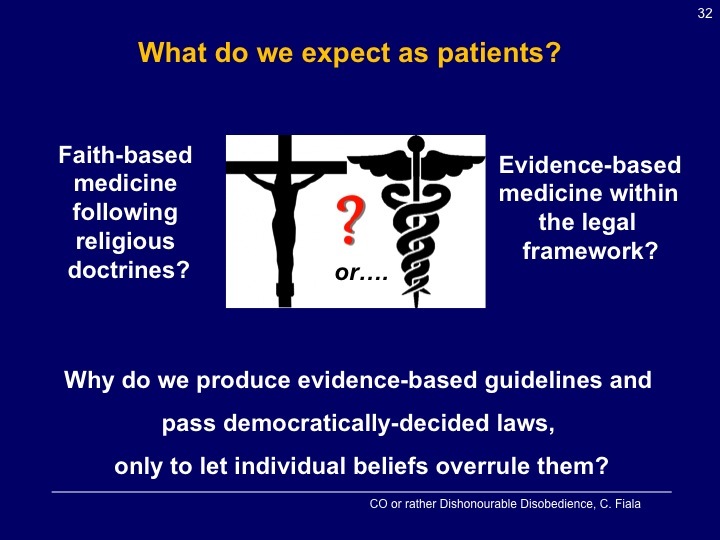 Doctors are rightly required to disclose their conscientious objection, but given the positioning of the patient and doctor, the act of doing so exploits the authority of the medical establishment in asserting the legitimacy of a particular moral view. Second, the conscientious objector plays an unusual and self-defeating moral role. Since she must immediately refer the patient on to another doctor who does not hold a conscientious objection, she becomes complicit, via her necessary causal role, in the implementation of the procedure. This means that doctors are not able to prevent abortions, rather, they are required to ensure that they are carried out, albeit by others. Since removing the disclosure and referral requirements may prevent patients from accessing standard medical care, the conscience clause should instead be revoked, and those opposed to abortion should be encouraged to select other specialities or professions. This would protect patients from judgement, and doctors from complicity. Many contributors to debates about professional conscience assume a basic, pre-professional right of conscientious refusal and proceed to address how to ‘balance’ this right against other goods. Here I argue that opponents of a right of conscientious refusal concede too much in assuming such a right, overlooking that the professions in which conscientious refusal is invoked nearly always operate as public cartels, enjoying various economic benefits, including protection from competition, made possible by governments exercising powers of coercion, regulation, and taxation. To acknowledge a right of conscientious refusal is to license professionals to disrespect the profession’s clients, in opposition to liberal ideals of neutrality, and to engage in moral paternalism toward them; to permit them to violate duties of reciprocity they incur by virtue of being members of public cartels; and to compel those clients to provide material support for conceptions of the good they themselves reject. However, so long as (a) a public cartel discharges its obligations to distribute the socially important goods they have are uniquely authorized to provide without undue burden to its clientele, and (b) conscientious refusal has the assent of other members of a profession, individual professionals’ claims of conscience can be accommodated. J Med Ethics. 2017 Apr;43(4):253-256. We respond in this paper to various counter arguments advanced against our stance on conscientious objection accommodation. Contra Maclure and Dumont, we show that it is impossible to develop reliable tests for conscientious objectors’ claims with regard to the reasonableness of the ideological basis of their convictions, and, indeed, with regard to whether they actually hold they views they claim to hold. We demonstrate furthermore that, within the Canadian legal context, the refusal to accommodate conscientious objectors would not constitute undue hardship for such objectors. We reject concerns that refusing to accommodate conscientious objectors would limit the equality of opportunity for budding professionals holding particular ideological positions. We also clarify various misrepresentations of our views by respondents Symons, Glick and Jotkowitz, and Lyus. Ronit Y. Stahl, Ph.D., and Ezekiel J. Emanuel, M.D., Ph.D.
“Conscience clause” legislation has proliferated in recent years, extending the legal rights of health care professionals to cite their personal religious or moral beliefs as a reason to opt out of performing specific procedures or caring for particular patients. Physicians can refuse to perform abortions or in vitro fertilization. Nurses can refuse to aid in end-of-life care. Pharmacists can refuse to f ill prescriptions for contraception. More recently, state legislation has enabled counselors and therapists to refuse to treat lesbian, gay, bisexual, and transgender (LGBT) patients, and in December, a federal judge issued a nationwide injunction against Section 1557 of the Affordable Care Act, which forbids discrimination on the basis of gender identity or termination of a pregnancy. conscientious objection to military service. Supporters of conscientious objection in health care explicitly referenced “the right of conscience which is protected in our draft laws” to justify and legitimate it. Yet conscientious objection in health care diverges substantially from conscientious objection to war. We highlight the differences and argue that, in most cases, professional associations should resist sanctioning conscientious objection as an acceptable practice. Unlike conscripted soldiers, health care professionals voluntarily choose their roles and thus become obligated to provide, perform, and refer patients for interventions according to the standards of the profession. The spread of demands by physicians and allied health professionals for accommodation of their private ethical, usually religiously based, objections to providing care of a particular type, or to a particular class of persons, suggests the need for a re-evaluation of conscientious objection in healthcare and how it should be regulated. I argue on Kantian grounds that respect for conscience and protection of freedom of conscience is consistent with fairly stringent limitations and regulations governing refusal of service in healthcare settings. Respect for conscience does not entail that refusal of service should be cost free to the objector. I suggest that conscientious objection in medicine should be conceptualized and treated analogously to civil disobedience. This article analyzes the idea of a legal right to conscientious refusal for healthcare professionals from a basic legal ethical standpoint, using refusal to perform tasks related to legal abortion (in cases of voluntary employment) as a case in point. The idea of a legal right to conscientious refusal is distinguished from ideas regarding moral rights or reasons related to conscientious refusal, and none of the latter are found to support the notion of a legal right. Reasons for allowing some sort of room for conscientious refusal for healthcare professionals based on the importance of cultural identity and the fostering of a critical atmosphere might provide some support, if no countervailing factors apply. 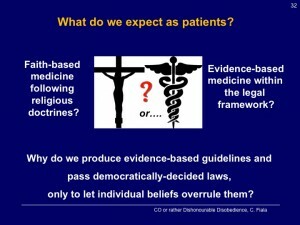 One such factor is that a legal right to healthcare professionals’ conscientious refusal must comply with basic legal ethical tenets regarding the rule of law and equal treatment, and this requirement is found to create serious problems for those wishing to defend the idea under consideration. We conclude that the notion of a legal right to conscientious refusal for any profession is either fundamentally incompatible with elementary legal ethical requirements, or implausible because it undermines the functioning of a related professional sector (healthcare) or even of society as a whole. A number of healthcare professionals assert a right to be exempt from performing some actions currently designated as part of their standard professional responsibilities. Most advocates claim that they should be excused from these duties simply by averring that they are conscientiously opposed to performing them. They believe that they need not explain or justify their decisions to anyone, nor should they suffer any undesirable consequences of such refusal. Those who claim this right err by blurring or conflating three issues about the nature and role of conscience, and its significance in determining what other people should permit them to do (or not do). Many who criticize those asserting an exemption conflate the same questions and blur the same distinctions, if not expressly, by failing to acknowledge that sometimes a morally serious agent should not do what she might otherwise be expected to do. Neither side seems to acknowledge that in some cases both claims are true. I identify these conflations and specify conditions in which a professional might reasonably refuse to do what she is required to do. Then I identify conditions in which the public should exempt a professional from some of her responsibilities. I argue that professionals should refuse far less often than most advocates do . . . and that they should be even less frequently exempt. Finally, there are compelling reasons why we could not implement a consistent policy giving advocates what they want, likely not even in qualified form. I argue that appeals to conscience do not constitute reasons for granting healthcare professionals exemptions from providing services they consider immoral (e.g. abortion). My argument is based on a comparison between a type of objection that many people think should be granted, i.e. to abortion, and one that most people think should not be granted, i.e. to antibiotics. I argue that there is no principled reason in favour of conscientious objection qua conscientious that allows to treat these two cases differently. Therefore, I conclude that there is no principled reason for granting conscientious objection qua conscientious in healthcare. What matters for the purpose of justifying exemptions is not whether an objection is ‘conscientious’, but whether it is based on the principles and values informing the profession. I provide examples of acceptable forms of objection in healthcare. J Clin Ethics. 2016 Fall;27(3):227-232. Abstract: The opinion of the American Medical Association (AMA) Council on Ethical and Judicial Affairs (CEJA) on the accommodation of conscientious objectors among medical doctors aims to balance fairly patients’ rights of access to care and accommodating doctors’ deeply held personal beliefs. Like similar documents, it fails. Patients will not find it persuasive, and neither should they. The lines drawn aim at a reasonable compromise between positions that are not amenable to compromise. They are also largely arbitrary. This article explains why that is the case. The view that conscientious objection accommodation has no place in modern medicine is defended. Advocates of a right to die increasingly assert that the right in question is a positive right (a right to assistance in dying) and that the right in question is held against physicians or the medical community. Physician organizations often reply that these claims to a positive right to die should be rejected on the grounds that medicine’s aims or ‘‘internal’’ norms preclude physicians from killing patients or assisting their patients in killing themselves. The aim of this article is to rebut this reply. Rather than casting doubt on whether assisted dying is consistent with medicine’s ‘‘internal’’ norms, I draw attention to the socioeconomic contexts in which contemporary medicine is practiced. Specifically, contemporary medicine typically functions as a public cartel, one implication of which is that physicians enjoy a monopoly on the most desirable life-ending technologies (fast acting lethal sedatives, etc). While there may be defensible public health reasons for medicine functioning as a cartel and having this monopoly on desirable life-ending technologies, Rawlsian contract-based reasoning illustrates that the status of medicine as a cartel cannot be reconciled with its denying the public access to supervised use of desirable life-ending technologies. The ability to die in ways that reflect one’s conception of the good is arguably a primary social good, a good that individuals have reasons to want, whatever else they may want. Individuals behind Rawls’ veil of ignorance, unaware of their health status, values, etc, will thus reason that they may well have a reasonable desire for the life-ending technologies the medical cartel currently monopolizes. They thus have reasons to endorse a positive right to physician assistance in dying. On the assumption that access to desirable life-ending technologies will be controlled by the medical community, a just society does not permit that community to deny patients access to these technologies by an appeal to medicine’s putative ‘‘internal’’ aims or norms. The most natural response to my Rawlsian argument is to suggest that it only shows that individuals have a positive right against the medical community to access life-ending technologies but not a right to access such technologies from individual physicians. Individual physicians could still refuse to provide such technologies as a matter of moral conscience. Such claims of conscience should be rejected, however. A first difficulty with this proposal is that it is in principle possible for a sufficiently large number of individuals within a profession to invoke claims of conscience so as to materially hinder individuals from exercising their positive right to die, as appears to be the case in several jurisdictions with respect to abortion and other reproductive health treatments. Second, unlike conscientious objectors to military service, physicians who conscientiously object to providing assistance in dying would not be subject to fundamental deprivations of rights if they refused to provide assistance. Physicians who deny patients access to these technologies use their monopoly position in the service of a kind of moral paternalism, hoarding a public resource with which they have been entrusted so as to promote their own conception of the good over that of their patients. Canada’s Supreme Court decided that Canadians’ constitutional rights are violated by the criminalisation of assisted dying. Canada’s politicians are currently scrambling to come up with an assisted dying regime within the 12 month period that the Supreme Court gave them to fix the problem. Since then, the Canadian Medical Association, the country’s doctors’ lobby organisation, has insisted not only that doctors must not be forced to provide assisted dying but also that doctors must not be required to transfer patients asking for assisted dying on to a colleague who they know will oblige these patients. In many countries, including Canada, conscientious objection clauses protect – mostly – healthcare professionals from being forced to act against their individual ideological convictions. I suspect it isn’t unfair to note that these protections in the real world are nothing other than protections for Christian doctors who are unwilling to deliver services they would be obliged to deliver to patients who are legally entitled to receive these services, were it not for their religiously motivated objections. Secular healthcare professionals could arguably avail themselves of conscience clauses, but in a liberal democracy, what reasonable conscience-based cause could they have to refuse the provision of healthcare services to patients? Conscience clauses today are by and large a concession of special rights to Christian healthcare professionals, at least in secular Western democracies. Often misrepresented in public debates by opponents of legal abortion, the clause attempts to balance a woman’s rights (her right to autonomy, religious freedom, timely medical and reproductive healthcare) against an individual health practitioner’s right to conscientious refusal. It does this by requiring the practitioners to inform the woman of his objection and to refer the woman to a qualified practitioner who does not object. Only in an emergency – where the refusal of the practitioners to perform an abortion means the woman will die – does the law deny practitioners an exemption to their standing obligation to treat. Conflict over medical refusal rights is a red-hot issue across the world. This is because conscientious refusal is largely unregulated and, as a result, there has been an explosion of individuals and institutions refusing care to a growing pool of patients. On September 9, 2009, President Barack Obama spoke before a joint session of Congress on the imminent need for health care reform. In his speech, he addressed the contested social issue of abortion in two ways: by reaffirming the ongoing exclusion of abortion from federal health care financing and supporting health care providers’ right to opt out of providing health care they find objectionable. “I want to clear up—under our plan, no federal dollars will be used to fund abortions, and federal conscience laws will remain in place” (Obama, 2009). His acceptance of the right to deny health care for ideological reasons directly contradicts the expectation most Americans share—that the care they receive will be consistent with the highest standards of scientific evidence, based on individual patient need, and with the goal of maximizing health and wellness. This commentary provides a brief investigation into this contradiction by providing a new way of thinking about health care denials using the same yardsticks employed to assess health care quality more generally: the adherence to evidence-based standards of care, a commitment to patient centeredness, and focus on prevention of poor health outcomes (Institute of Medicine Committee on Quality of Health Care in America, 2001). The contents of this commentary are drawn from a report to be released by the National Health Law Program, Health Care Refusals: Undermining Quality Care for Women (Fogel & Weitz, 2009). Although the full report addresses broader needs for care related to pregnancy prevention, pregnancy termination, fertility achievement, and healthy sexuality, this commentary is limited to a few standards of care that necessitate abortion as a health care option for women. SELA (Seminario en Latinoamérica de Teoría Constitucional y Política) Papers. Paper 65. 2009. Although for centuries conscientious objection was primarily claimed by those who for religious or ethical reasons refused to join the ranks of the military (whether out of a general principle or in response to a particular violent conflict), in recent decades a significant broadening of the concept can be seen. In Thailand, for example, doctors recently refused medical attention to injured policemen suspected of having violently repressed a demonstration. In Argentina a few public defenders have rejected for conscientious reasons to represent individuals accused of massive human rights violations. In different countries all over the world there are doctors who refuse to perform euthanasia, schoolteachers who reject to teach the theory of evolution, and students who refuse to attend biology classes where frogs are dissected. prenatal care and birth control, even when no one is ill. We call upon medicine to ameliorate a dying patient’s suffering, even when the disease cannot be healed nor function restored. BMJ. 2006 Feb 4; 332(7536): 294–297. Shakespeare wrote that “Conscience is but a word cowards use, devised at first to keep the strong in awe” (Richard III V.iv.1.7). Conscience, indeed, can be an excuse for vice or invoked to avoid doing one’s duty. When the duty is a true duty, conscientious objection is wrong and immoral. When there is a grave duty, it should be illegal. A doctors’ conscience has little place in the delivery of modern medical care. What should be provided to patients is defined by the law and consideration of the just distribution of finite medical resources, which requires a reasonable conception of the patient’s good and the patient’s informed desires (box). If people are not prepared to offer legally permitted, efficient, and beneficial care to a patient because it conflicts with their values, they should not be doctors. Doctors should not offer partial medical services or partially discharge their obligations to care for their patients. Eighteen years after the era of Karen Ann Quinlan, the debate over futile care has shifted. Now some patients are asking for treatment that care givers believe to be useless. In virtually all cases of so-called futile care, the real disagreement is not over whether a treatment will produce an effect; it is over whether some agreed-on potential effect is of any value. An obvious reason to resist providing care believed to be futile is that is appears to consume scarce resources and therefore burden others. However, for care that affects the dying trajectory but appears to most of us to offer no benefit, the proper course is for society–not clinicians–to cut patients off. Under certain circumstances patients should have the right to receive life-prolonging care from their clinicians, provided it is equitable funded, even it the clinicians believe the care is futile and even if it violates their conscience to provide it. Society is not in a position to override a competent patient who prefers to live even if life prolongation is burdensome. For incompetent patients, if a clinician believes a treatment is actually hurting a patient significantly, he or she may appeal to a court to have it stopped. A society that forces people to die against their will produces more offense than one that forces healthcare providers to provide services that violate their conscience. And medical professionals have a social contract with society to control the use of medical, life-prolonging technologies.